Their outstanding warranty and quality products that are suitable for agricultural, commercial, light industrial and residential installations. A metal roofing system will serve a homeowner better than any other currently available roofing materials. While the initial investment in a metal roofing system is substantially higher than other roofing materials, the key word is “investment”. Asphalt, wood shake or other limited life roofing systems are and always will be recurring expenses. A properly installed metal roofing system will be installed once and the monetary savings that offset the initial investment will begin to accumulate from Day 1. These savings along with many other benefits will continue throughout the roof’s life cycle. When other roofing materials have been replaced one, two or even more times, a metal roofing system will still be in place serving and protecting the homeowner. The value of your home will increase the moment your installation is complete. Whether you are planning on living in your home for twenty years or selling it in five, a metal roof will never be a cost again. The roof is a significant factor in the appraised value of a home. No homeowner enjoys ongoing expenses especially ones with a substantial price tags like roofing. From both the homeowner and potential buyer perspectives, the age, condition and type of roof represent cost in addition to the market price of the property. As well as the eventual replacement of lesser roofing materials, a homeowner has maintenance expenses to contend with. Limited life roofing materials degrade rapidly when faced with normal wear and tear from nature itself. Wind rips up shingles, hail causes impaction, water, snow and ice buildups lead to leaking or ice dams, fungus and mildew undermine material strength, the list goes on and on. The durability and strength of metal roofing make it almost impervious to damage from natural elements. The product is just that good and a review of the warranties offered on metal roofing products support this stance. The manufacturers know how good their products are and because of this high quality can and do offer strong warranty protection. Does this mean that there is no maintenance on a metal roof? No, every roof requires maintenance but a metal roof is virtually maintenance free and the cost of that maintenance is minimal. The roof is the first and most important defense component on your home. 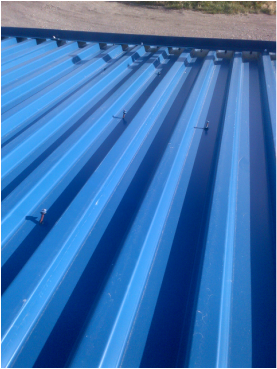 The strength and quality of metal roofing protects the structure so well that damage is minimized. Metal roofing systems also result in energy savings. Depending on climate, the homeowner can realize substantial decreases in energy costs. In hot climates, metal roofs reflect rather than absorb heat and what heat is absorbed is rapidly released due to high emissivity factors. The result is a reduction in cooling costs. In cold or wet climates, the non porous surface of metal repels moisture and resists freezing. This means that both water and snow slide from roof resisting damage from ice dams and other related issues. One final financial benefit to metal roofing is that many government agencies, utility providers and insurance companies are recognizing that the benefits homeowners realize as a result of metal roofing systems also result in lower costs to them. Dependant on the region you live in, your providers may be offering tax incentives, rebate programs and/or reduced insurance premiums to metal roof owners. Metal roofing looks great and will add curb appeal to any home. Metal roofing successful mimics all other roofing materials. This combined with its wide range of styles and colors make it suitable in any neighborhood. In addition, the flexibility of the product enables it to be used in almost any situation and allows its full integration with most construction materials. The environmental benefits of metal roofing are well documented. Metal roofing contains recycled content and because using recycled material in the manufacturing process is more economical than using virgin material, this trend is likely to expand and grow. As a long life product, metal roofing reduces the amount of replacement materials needed which in turn contributes to reduced energy use and greenhouse gas emissions related to manufacturing, shipping and installation and ultimately disposal. As well, at the end of its long life cycle, the product is 100% recyclable, itself. Another environmental benefit of metal roofing relates to the versatility of the product. Many times a metal roof can be installed over the existing roof. This keeps the old roofing materials out of the landfills. As well, the versatility of metal roofing allows for adaption to solar energy panels and metal is the material of choice for consumers interested in water catchment systems. Finally, metal roofing contributes to home energy reduction and energy reduction is an important part of environmental stewardship. If environmental solutions are important to you then rest assured that metal roofing is a great choice for the planet. In the end, metal roofing provides a home owner with peace of mind. A properly installed metal roofing system will last a lifetime and has strong warranties behind it to support this claim. A metal roof requires less maintenance and the cost of that maintenance is minimal. It’s strength and durability protects both you and your home structure from the elements and improves your chance of surviving in a natural disaster. Metal roofing stands up to both strong winds and hail storms. It’s fire resistance is unmatched and in the event of an earthquake, this light weight product will put less stress on your building structure and help avoid a roof collapse. An investment in metal roofing system offers substantial financial benefits including reduced maintenance costs, utility savings, increased home value and possibly tax breaks from the government and reduced insurance premiums. Metal roofing is a good choice for our planet. When looking at the benefits metal roofing systems offer, it truly is difficult to entertain any other choice.